The Trump administration has attacked immigrant communities from day one with a range of misguided proposals and executive orders that undermine civil rights and terrify families. These efforts are having devastating effects – right now, as well as potentially long term – on the health and well-being of our nation’s youngest residents. Two new reports issued by the Center for Law and Social Policy (CLASP) examine how the Trump Administration’s anti-immigrant rhetoric and policy priorities are wreaking havoc in the lives of young children. Through interviews with more than 100 child care and early education professionals in six states, along with focus groups with dozens of parents, CLASP found pervasive effects of these threats on children. The reports detail disturbing signs and behaviors of distress, as well as serious risks to young children’s healthy development. Because of their isolation and fear, immigrant families are reluctant to seek nutrition assistance, health care, and early care and education programs, which is compromising the wellbeing of their children. Examples included a special-needs child being pulled out of recommended treatment by parents fearful of being detained by immigration authorities, early childhood programs unable to fill their classrooms despite burgeoning need, and families declining nutrition assistance. A new federal regulation being drafted by the U.S. Department of Homeland Security would push kids, parents and other members of low-income immigrant households further into the shadows by dramatically altering the “public charge” provision of federal immigration law. The most recent version of this draft proposal was leaked to the media last month and aims to punish immigrant families who seek access to health, nutrition, and housing programs for themselves and their children. Under the proposed rule, any person whose family seeks or uses a wide range of human services programs—from affordable housing, home heating assistance, and health coverage, to anti-hunger benefits, the earned income tax credit, and other essential services – could face barriers to maintaining or improving their immigration status. The proposed rule would expand scrutiny to include the applicant’s family – including U.S. citizen children. If the draft provisions are finalized, parents would be forced to make impossible choices between putting food on the table for their children or obtaining secure immigration status. We know that access to preventive health care and nutrition helps improve childhood outcomes, which extends to better education and employment outcomes in adulthood. Creating barriers to essential programs would have lifelong damaging consequences for millions of children in immigrant families. 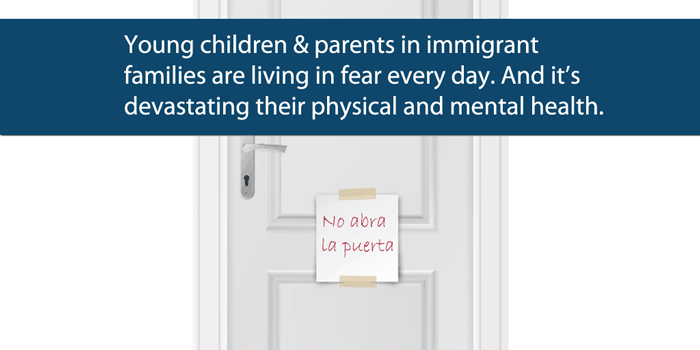 Increased immigration enforcement and anti-immigrant rhetoric is already deterring immigrant parents – documented and undocumented alike – from seeking medical help for their children or enrolling them in critical programs. The Trump administration’s dangerous proposal would deny more children access to lifesaving care and drive up poverty among families with young children who are vital to our collective future. Children of immigrants represent one quarter of our increasingly diverse U.S. child population and will make up a critical segment of the future workforce. Preventing these kids from having their most fundamental needs met and driving them further into poverty will undermine our communities and our country for generations to come. The draft notice of proposed rulemaking was sent to the Office of Management and Budget at the end of March. The next step is for the rule to be published as a proposal in the Federal Register. Then, the public will have a relatively short window of opportunity to make comments and pose questions on the published rule. For now, immigrant families should continue to seek benefits for which they are eligible. As currently drafted, the rule would not be retroactive and—even if finalized— some immigrants are not subject to the public charge determination. During this unprecedented time of attacks on immigrant families, advocates must come together and reject this dangerous and shortsighted proposal, and others like it, which seek to divide our communities and undermine low-income, working families. Ultimately, our nation’s leaders should be pushing for policies that help all our children thrive—regardless of where their parents were born—for their sake and for that of the entire country. We can’t sit on the sidelines while the Trump administration attempts to punish parents for feeding their kids. The Center for Law and Social Policy (CLASP) and the National Immigration Law Center (NILC) are monitoring this threat closely and leading a strong pushback effort together with our partners across the nation. Once the proposed rule is published, there will be an opportunity for public comments, which the agency must respond to before finalizing these changes. We invite you to join us in submitting comments to the Department of Homeland Security in opposition to this rule and encouraging others in your network to do the same. For more resources, talking points, and information about how you can connect with other advocates in this fight, please visit Center for Law and Social Policy (CLASP) website.